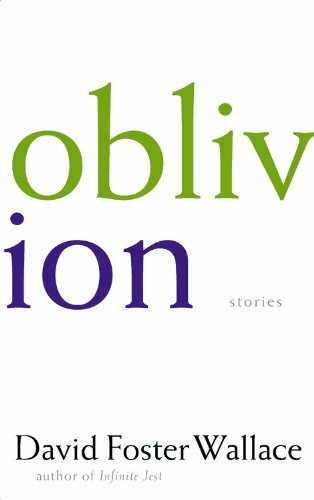 Oblivion is David Foster Wallace&#146;s third and best collection of short stories to date. Without sacrificing his flair for brainy surreal prose and dead-on social satire&#151;which have on occasion seemed like ends in themselves&#151;Wallace has added a stronger than usual emphasis on narrative drive and ingenious plotting. Consistently impressive is his much-admired talent for bringing a plaintive three-dimensionality to the inner lives of his characters. Six of the eight stories here are long and intricate examples of the author&#146;s labyrinthine tale spinning. And yet, one of the most memorable pieces is only three pages in length. A masterpiece of heart-stopping brevity, &#147;Incarnations of Burned Children&#148; concerns the frantic efforts of a mother and father to console their infant son who has been severely scalded from an overturned pot of boiling water on the stove. The child&#146;s screams, we&#146;re told, &#147;were regular as breath and went on so long they&#146;d become already a thing in the kitchen.&#148; As the title suggests, Wallace imbues the story with a mythic universality. The characters and the locale are never named, thus allowing readers to distance themselves from the horrific scene while at the same time pondering the eternal verities of familial tragedy. In the story &#147;The Suffering Channel,&#148; a corporation with the motto &#147;consciousness is nature&#146;s nightmare&#148; plans to launch a cable channel devoted to human misery. It&#146;s a motto suitable for much of Wallace&#146;s work. No other contemporary American author has so painstakingly&#151;and hilariously&#151;mapped the incessant dysfunctional chatter that streams through our heads and masquerades as rational thought. &#148;). Visits to an unsympathetic psychiatrist and a high-tech sleep clinic succeed merely in compounding Napier&#146;s frustration. The ending delivers a double whammy that will have enterprising readers going back over the narrative and trying to follow the breadcrumb trail of bizarre clues. Wallace is nothing if not fearlessly ecumenical in his literary tastes and influences, at times blending elements of science fiction and fantasy with a kind of micromanaged naturalism. &#147;Good Old Neon,&#148; for example, begins as a painfully detailed confession of one man&#146;s route to suicide. &#147;I know this part is boring,&#148; he laments, &#147;but it gets a lot more interesting when I get to the part where I kill myself and discover what happens immediately after a person dies.&#148; Remarkably, the story fulfills its promise: We&#146;re treated to an eerily plausible and unsentimental glimpse of the afterlife. Sometimes Wallace&#146;s relentless quest for offbeat material can become tedious and self-indulgent on the page. The collection&#146;s opening piece, &#147;Mister Squishy,&#148; relies rather too heavily on the drone of acronym-laden corporate-speak at a Chicago ad agency. (&#147;Down the hall and past the MROP Division&#146;s green room, in another R.S.B. conference room whose windows faced NE, Darlene Lilley was leading twelve consumers and two UAFs into the GRDS phase of Focused Response without any structured QA or ersatz Full-Access background.&#148;) It&#146;s something of a lost cause, but &#147;Mister Squishy&#148; springs fitfully to life with an impending act of domestic terror involving a deadly batch of home-brewed ricin. The triumph of Oblivion is a deepening sense of compassion in Wallace&#146;s work. While alienation and despair remain key themes, his characters are so richly drawn that they behave less like pawns of injustice or fate than tragic purveyors of their own limitations. &#147;The Soul Is Not a Smithy&#148; is notable for the graceful manner in which its layered story lines intertwine and mirror one another in unexpected ways. The narrator is recalling a traumatic experience from his childhood when he was nine years old and a grade school teacher suffered a nervous breakdown at the blackboard. Fervently daydreaming in the back of the room, the narrator failed to notice the exodus of frightened classmates. &#147;For my own part,&#148; he tells us, &#147;I had begun having nightmares about the reality of adult life as early as perhaps age seven.&#148; As he reflects on the monotonous insurance company job his father dutifully held for years, an unspoken parallel emerges between the school teacher and the father, as well as the narrator himself. How does an individual avoid going crazy in dehumanizing circumstances? Fear, it seems, is subdued via the transformative gestalts of storytelling and daydreaming. Chaos is held at bay by shaping and refining it into a coherent narrative. David Foster Wallace has long been a master at showing us the face of chaos. Oblivion represents his blossoming into a writer of profoundly artful coherence.